Spending so much time in Italian kitchens making gnocchi has become second nature. With so much leftover mashed potatoes in the fridge I decided to do something fun with it. You will rarely find gluten free potato gnocchi, they normally make cheese gnocchi gluten free but this recipe works great. Mix everything together saving the flour for last. Work with about 1/6 of the dough at a time. Take about a handful and place it on a well floured cutting board. Roll dough out into long strips about 1 inch thick and about one foot long. Use a sharp knife and cut the strip into pieces a little less then an inch. Place the pieces in boiling water. Once they start to float give them an addition 3-4 minutes to cook. They will plump up and look very soft but they harden as they cool. Cook all the gnocchi in a few batches. If you have to many in the pot they will bump into each other and not cook correctly. Strain each batch in a calender and allow to cook on a large cookie sheet. I continue roll out and cut the gnocchi as I cook them. Once all the gnocchi are done I place them in a large deep pan over medium heat. Give them a little toss to re-heat and add any sauce you would like. 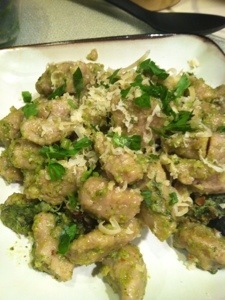 This time I used pesto but red sauce or even some butter, capers and cheese would be great.